Malti poo is a mixed dog breed and it is created by the crossing of Maltese and poodle. This dog breed is remedial and it is particularly referred to as ''designer dogs''. The Maltipoo is one of the well-proportioned, sporty, and a cheerful dogs' breed and exhibits a very energetic and animated expression. They are very quick-witted and possess a dynamic force. The Maltipoo is affectionate, loyal, and loving. They are the best companions with aged people and like to be with children. They easily adjust themselves with other dogs and non-canine pets and generally own a very caring and outgoing nature. They are not good at taking care of their of their surroundings well. The Maltipoo have a very long, silky and a bit wavy coat.This kind of a dog breed may have a tendency to become obstinate. 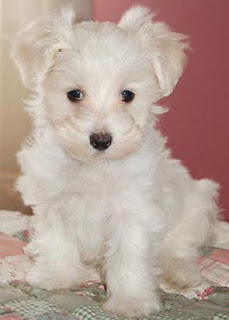 One of the positive traits of the Maltipoo is that they are very sharp and like to make their masters happy. They will never learn if treated rudely so, it is necessary to train them gently with, firmness, politeness, patience, and consistency. They are good to keep as a pet dog in apartments and urban areas.Maltipoo likes to mingle up and gets easily socialize, so it is good for them if they are taken for leashed walks and off-lead play time under security and supervision. The Maltipoo may possess a curly or a long coat, so it is recommended to get their coat clipped by the professional help and requires daily brushing in case of long coat. Bathing should be done when necessary using a mild shampoo. They may expect to have health issues like eye and skin disorders.